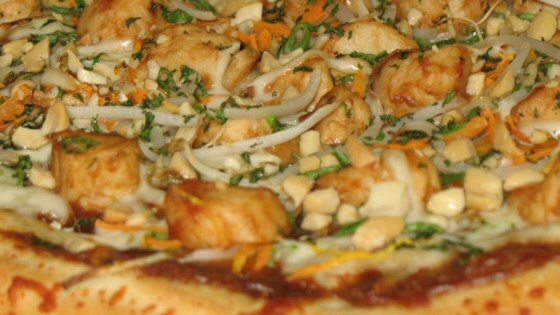 "Peanuts, chicken, and cilantro lend a Thai twist to this easy pizza!" Adjust oven rack to lowest position, and heat oven to 450 degrees. Place crust on a cookie sheet. Mix peanut sauce and peanut butter, then spread 2/3 of the sauce over the pizza crust; toss remaining 1/3 of the sauce with the shredded chicken. Spread chicken over pizza. Bake until the crust is crisp and golden, 10 to 12 minutes. Remove from oven, and top with carrots, green onions, peanuts and cilantro. Cut into 6 slices and serve. * Find Thai peanut sauce in the grocer's Asian food aisle; use a rotisserie chicken or a package of pre-pulled roasted chicken. I used Thai-Style Peanut Sauce w/ Honey from this site and thought this pizza was delicious...very similar to my fave one @ California Pizza. My friend and I agreed that this was pretty good, but not great. Picking a peanut sauce you love is key. Great recipe! I have made it several times and love it!